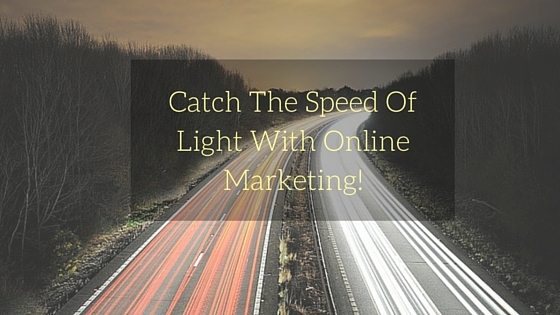 Catch The Speed Of Light With Online Marketing! Online Marketing Online Marketing! A word which I can say travels faster than light in present’s aeon. To keep on travelling with it, you have to start thinking independently act critically and express creatively. Whenever you start thinking about Online Marketing, what is the very first thing which comes in your mind? Think ! Think more! If you’re in the same boat in which I am sitting, then probably I can help you out with these three capping questions. In the simple altercation, it can be said that Online Marketing is nothing more than “Art of Marketing”. Here you never aim your customers directly by promoting your business but you attract them to such an extent so that they by themselves buzz towards you to know and understand your services. #Web Marketing: Which includes e-commerce websites, promotional or informative websites, online advertising and Organic Search Engine. # Social Media Marketing: It’s the eye candy of Online Marketing. It includes both advertisement and promotion of the services through the flawless Social Mediums like Facebook, Twitter, LinkedIn, Google+, Digg and many more. I hope going through the all, the picture of Online Marketing in your mind must have become quite clear. Now moving towards the most significant part of Online marketing. I know, what you must be thinking.. That’s it? Here is the Online Marketing 6 Starter Kit that could become your table stakes for marketing. But, we the marketers of today are smart enough to inspect that half . But for that, you must be handy with such analytics tools and team that can understand and express that how to use data. Conversion Optimization let the people which come to your website or anywhere you are leasing with them, usually in the kind of filling a form so that you can, at least, know their email addresses. As I have already said that Email is the 900 pounds King Kong in Online marketing. It’s the face of your business. By Email in online marketing, I didn’t mean spamming people or buying the email list. Email is the front face and your best communication media of your business with your customers. Nobody will like you entering their home without their permission, neither your customers. It is the heart of Online Marketing. All your efforts will go in vain if you’re not getting searched over the internet. Search Engine marketing compels to both paid ads and Search Engine Optimization. Simply make it clear in your mind that “whenever someone is searching and that is what you deliver, you have to be the first to appear on .” SEO is not only about enhancing the technical aspects of your site but also delivering the reliable content which is actually get valued up by Google. The most creative face of Online Marketing is Content. Content is the only thing which can create a difference between your services and services delivered by others. If you’re doing online marketing, Trust me content is the only thing which can make people follow you and not you chasing people. Marketing Automation wraps up altogether. It is a technology of bringing traffic which includes analytics, online forums, Tracing what people actually do when they visit your website. It’s always important to to keep an eye on your customers as they are the only judge of your success. These are the pack of 6 basic kits to help you out in doing Online Marketing but never ever leave the hands of Social Media because in business whatever you do need to be exposed to your viewers. Social Media is the best platform to expose all about you and your company promote it to a high level and make your service reach every customer. Coming to Why, I don’t think that any of the business people would like to ask this question. There was a time when going online was a big deal for any business but now if you really want to survive in the market you have to do it there is no choice for you to check Why and Why not. Still you want a single reason to start it up, I can guide you five. The best benefit of Online Marketing I can feel is your shop remains open up 24X7. You need not take care of time, your customers can visit you anytime, at any hour of the day or night they want. Marketing over cloud will cost you much less than the old door to door marketing. You need not take care of Marketing space, maintenance and all those stuff which seriously means nothing for your business. Everybody likes to get something special for them rather than standing in a crowd, with online marketing you can give a personalised touch to your customers by the information provided by them only. It helps in building a strong relation with your customer. It helps you in making your customer aware of your each and every step. Internet Marketing helps you getting involved in the overgrowing era of Social Media. It creates a social prestige of your services. As I said everything in business needs an exposure so that your customers can know you better and Online Marketing very smartly helps you in doing this. Go pick up your own reason and own situation and get handy with it as fast as possible.